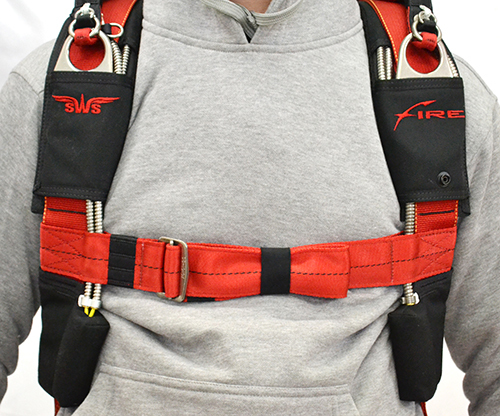 The Yoke is the key element that provides the appropriate adjustment to the body of a skydiver. The harness system for the containers made by SWS is designed «from waist». The correct position of the container (or, to be exact, the bottom of the container) on the back is taken as a basis in terms of appropriate arrangement of weight, ergonomics, and comfortable deployment. Due to this the container is always located at the same place – slightly over the waist during execution of any move. Up from this point the back of the container is designed, after that the required length of (one out of three sizes) Yoke to provide the appropriate placement of the Three rings on the appropriate spot (on the collarbone) for any individual figure and any individual size.